Home News Can BioBanking save NZ’s biodiversity? Can BioBanking save NZ’s biodiversity? Biobanking may have the potential to resolve key issues facing ecological exchanges in New Zealand, says a new report by the Environmental Defence Society – but first, current law and policy frameworks governing biodiversity impact management will need an overhaul. 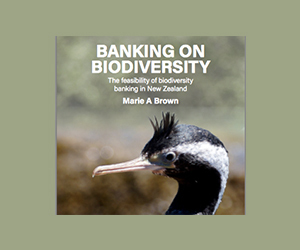 The report titled Banking on Biodiversity: the feasibility of Biobanking in New Zealand explores how habitat banking could contribute to the management of New Zealand’s biodiversity, once certain changes have been effected. The report’s author, Dr Marie Brown, says that the way offsetting is currently undertaken is often deeply flawed and has led to net biodiversity loss. “Key weaknesses include poor compliance, lack of expertise in implementing offset projects and an inability to carry out offsets in advance of impacts. Biobanking could help address some of these issues,” says Dr Brown. She says the mitigation hierarchy – avoid, remedy, mitigate – should be pursued vigilantly and offsetting brought to play only where there are unavoidable, residual impacts on biodiversity. But the weak policy framework for offsetting must first be addressed first. The report’s overall conclusion is that biobanking has a potentially useful role in formalising an offsetting regime but there is more work to do before it could be credibly used in New Zealand, including strengthening the legal basis for offsetting. The report was published by EDS with support from the Ministry for the Environment, NEXT Foundation, The Nature Conservancy and the Department of Conservation. To read and download the report, click here.